Discussion in 'Tortoise Diet and Food' started by Kapidolo Farms, Apr 9, 2017. Other wonderful meals by other members are @Anyfoot here http://www.tortoiseforum.org/threads/live-naked-people.126107/page-11#post-1371343 TFO said the file was too big to repost your image. I do "get it" that free range/graze is great for a few tortoises in a very large outdoor enclosure. But I have more tortoises than outdoor enclosure, so the grocery store is the tortoise food life for me. I buy at Restaurant Depot and some wholesalers who will sell COD to some weird guy that wants to buy case quantities for tortoises. Sometime Costco and Smart and Final have better prices. H-Mart a limited national grocery chain (Korean foods, bigger than most grocery stores though, their produce section is bigger than a small grocery store) has many wonderful things for a tortoise chef. I don't know if Julia Child would approve of the title "tortoise chef" but that's okay. This thread is about grocery store greens prepared to be a good diet. @RosemaryDW please share your culinary tortoise talent. YuiArbadla, Eggsy, Luvfasthounds and 5 others like this. This is great. Being that I'm in Alaska, the store is my go to until we make our transition this fall! 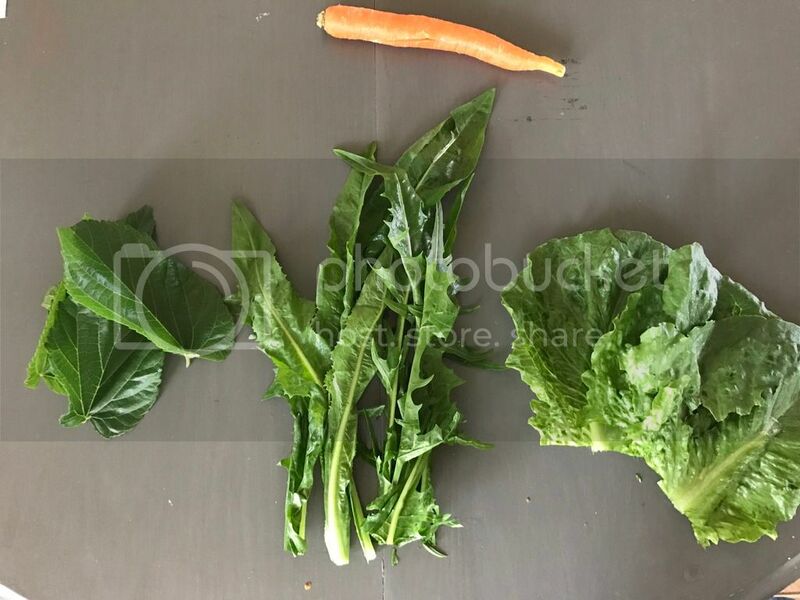 This morning our little Sully had a breakfast of chopped romaine, arugula, endive and bok choy; topped off with some shredded grassland pellets. RosemaryDW and Pearly like this. Wow, thanks for asking @Will ! I don't know that I'm a chef, just someone with time on my hands and a great location in Southern California. There are a couple of threads I made about shopping at farmers markets, particularly those with Asian or Indian produce. Small and large Asian markets are in many cities, for those wanting to poke around at new foods. This is one from when I was first feeling comfortable with our market; I have since found several more plants (chayote and bitter melon vines are frequently available). I've also gotten more comfortable with throwing in the occasional random Asian greens, as her diet is so varied. http://www.tortoiseforum.org/thread...pecializing-in-asian-or-hmong-produce.140654/ It's interesting how often people tell me of a tortoise or turtle they owned or cared for; usually they've been feeding it wrong, alas. Not an individual thread but I always like to tell new members to check their hispanic markets for spineless cactus, marked "nopales." As for this week's offerings, it has been a phenomenal year for rain so we still have weeds galore; yesterday I picked wild sunflower, mallow, bindweed (she's a Russian! ), bristly ox-tongue, sow thistle, prickly lettuce, wild geranium, naturalized nasturium. These weeds won't stay green for long so I like to load up while I can. Also on the menu for this week are some daikon radish leaves and fifty cents worth of bitter melon vines and amaranth from the farmers market. Amaranth is a "no" food on the Tortoise Table list because of oxalates; I personally don't worry about oxalates, partially from what I've read here from @Will ! She's also eating yarrow, evening primrose, and sage from the garden, along with whatever flowers drop from the abutilon plants (Indian Mallow.) When we aren't looking, she's trampling clumps of iris to get to the flowers. This sounds like a ton of food for one week but she's in a very large area and her appetite has been enormous this spring. I don't have anywhere near the experience our multiple tortoise owners do but I've been really impressed at her willingness to try new foods after a full year of being fed by us. She's finally slowing down, this should be more than enough for the week! Should we somehow run out, I've got plenty of chicory and frisee in the human fridge to share. Gillian M, Kasia, GingerLove and 3 others like this. @Will I've recently seen a post or two from you on dried nopales that I found really interesting. They sound like a great addition for anyone with a bunch of tortoises and/or cold weather. Is that something you could describe here? Pearly and Kapidolo Farms like this. Criminy, I just saw the line from Will in the first post that makes it clear the thread is about grocery store greens only! No wonder I was surprised to be mentioned in the original post. Can a moderator help me delete the portions about weeds? Or just nuke the entire post and I'll make a new one with just info on foods from farmers markets and Asian greens. Kapidolo Farms and Pearly like this. No need. You post fits in nicely. kellygirl64, Pearly and Kapidolo Farms like this. Struck gold at my local Mexican farmers markets today. I came away with free green leaf, watermelon, cucumber, pineapple, and tomatoes, plus an offer to come back for more. I was hoping for more greens, but maybe next time. RosemaryDW, Pearly and Stuart S. like this. @RosemaryDW weeds are good to. To great extent most post about food and feeding see to be about which weed is edible or what to buy. Not so much about what and how it is fed. It's all good. 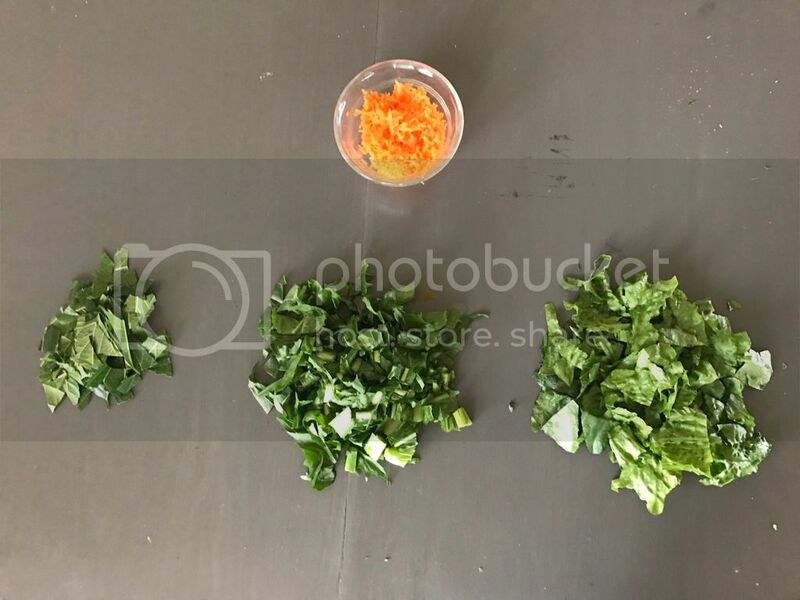 The first five images are the greens that went into today's salad. I used only four of the six heads of romaine. That second image is the back label of the SpringMix showing what may(???) be in the bag. Right now cases of Romaine in CA are $40 to $70 which is crazy, so the smaller bags of cleaned heads at $250 are the better choice. I prefer to buy whole cases. Two heads of escarole sit on top of the Spring Mix before being chopped. Then we have a dry and moistened ZooMed grassland pellets image, they really "volumize". Those greens, the pellets, and one zucchini are mixed as a "base" mix. To this base I add cuttle bone dust and a small amount of Vionate powder. Next image is the hand crank grater. No cactus today, however all the non-leafy things get grated with this - cactus, squashes, the occasional carrot, sweet potato, etc. I hand chop mushroom they don't grate so well. Those pictures follow the grater image. As mushrooms are such good "bio accumulators" I spend the little more and buy certified organic. That base salad is fed to Pancake, Leopard, Egyptian primarily. Then to the base that is for Forstens I add more squash. I take some of the base salad and mix in more squash and the mushrooms. This mushroom added salad goes to P. planicauda, and hingebacks. On blossom days I feed the hingebacks first, then mix in blossoms for the planicauda. Some days I collect enough blossoms they are added to the base. Lone dandelions are fed as-is to the Egyptians. The last image is the base salad. In all it takes about 1/2 hour to 45 minutes to prepare this. That depends on how much coffee a drank so far any particular morning. Russiantortylady, Eggsy, kellygirl64 and 4 others like this. I read many scientific and lay/gray articles regarding cactus as a food item for people and livestock. In all that I decided drying some at low temp was appropriate. It helps maintains a higher post processing amount and range of protein and other nutrients. My pancake tortoises taught me about its acceptability in the first place, they were going after some that had dried in their enclosure. I use a hand crank food grater, and dry at 112 F. I remove glochids with stainless steel pot scrubbers and quick once over with hand held blow torch. Then grate and dry. My own shelf life tests show if stored in a cool dry place in a closed zipper bag, like a kitchen cabinet (not above the stove) they retain their color and smell for about a year. I overproduce it so that I keep some mixed into the diet of my tortoises at home, but for the most part use fresh grated cactus. To use it I recommend re-wetting in regular room temp or cold tap water for at least 20 minutes or overnight in your frig. I use cactus once or twice a week either the fresh or dry re-hydrated. Blackdog1714 and Pearly like this. I should have mentioned that I also feed the above diets to my box turtles. To get them started eating greens I would chop it up real small and strain the juice off of the canned cat food types that have juice - "meaty bits" "Prime fillets" etc. and pour it over the greens, mixing it all up until all the greens are coated with the cat food juice. Once they were finishing off all the greens I started cutting back on the cat food juice and now they eat greens and veggies without cat food. I occasionally will add some night crawlers, pin head crickets, etc. to the box turtles' menu. Eggsy, Turtlesfromcolo, TammyJ and 2 others like this. I also "get" that a grazing or self sustained type-diet is preferable and would never argue against that. It's definitely a goal of mine to get to that point, but it's not practical right now, and I think a grocery store diet can more than suffice the dietary demands of our tortoises. I have read that the effects of grocery store food is similar to us eating fast food, but I've never quite understood that argument. Maybe I don't know enough about lettuce or the like, but I don't believe that the effects of grocery store foods on a tortoises body are similar to what happens with us when we eat a Happy Meal. I think the term "varied diet" is key to remember when offering a grocery store (or even grazing-type) diet. Sorry to gripe, but I appreciate the topic of the thread and glad to see it's a "sticky thread"
I also shop at the Restaurant Depot and have even gone as far as to reach out to the farms where their food originates to find out about their supply chain and exact content of their mixed foods (spring mix, greens mix, etc...). The growers are surprisingly eager to share a lot of that information. Anyway, there's some good stuff to be found there. I particularly like their bag of mixed dark greens. I am never consistent with what I feed or how I feed. Sometimes I cut things up finely, or sometimes I'll offer full leaves. I had a little spare time the other day so I did the chop em up method in preparing a meal for the stars. 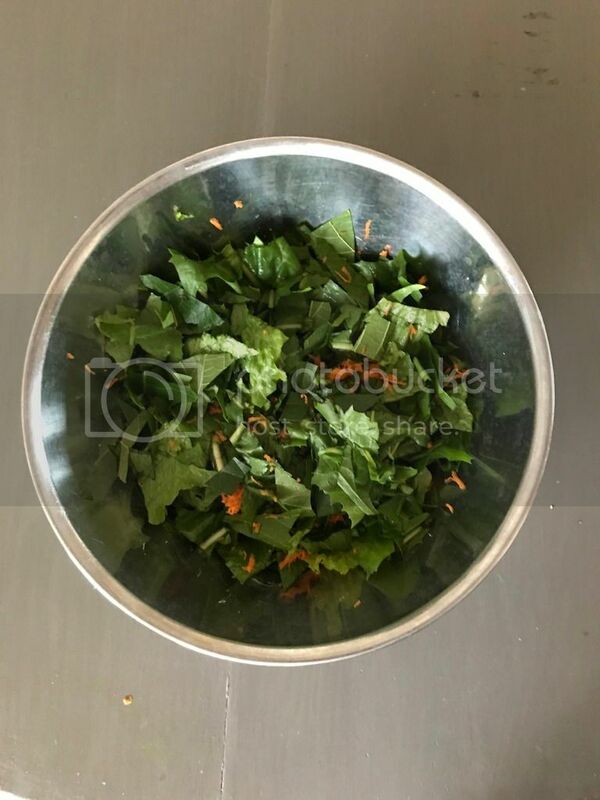 This mix was about 15% mulberry, 40% dandelion, 40% romaine and 5% carrots for some color appeal. I cut off the stems and less green portions of the lettuce. I heard the greener the better at some point and have always just tossed the less green portions to the leopards who graze more than the other types I have. A basic pair of scissors and grater took care of all this in less than 3 minutes. It takes a bit longer when preparing the hatchlings meals as I usually chop things up finer. All mixed ready to go. Maro2Bear, RosemaryDW, TammyJ and 3 others like this. What a great idea to start this thread! I think it will help so many new tort keepers! I may add some of my "tort meal recipes"
Angie312, TammyJ, Stuart S. and 1 other person like this. Pearly, Stuart S. and Anyfoot like this. Kapidolo Farms and Stuart S. like this.